This aircraft was the outstanding French day bomber/reconnaissance aircraft of World War I. The Bre 14 A2 reconnaissance version and the Bre 14 B2 bomber equipped at least 71 French escadrilles on the Western Front by November 1918 and were also used by units in Serbia, Greece, Macedonia and Morocco. The prototype flew for the first time on 21 November 1916. Production was spread over seven manufacturers, in addition to the Louis Breguet factory at Velizy, near Paris, and some 8,000 of the type were built up to 1926. A robust two-bay unequal-span biplane of mixed construction, it was remarkable for its time in the amount of duralumin used in the fuselage and wing structure. Covering was of fabric. The metal cowling over the 238.5kW Renault 12Fe engine was extensively louvred and a distinctive frontal radiator was fitted. The Bre 14 A2 was armed with a single fixed 7.7mm Vickers machine-gun on the left side of the fuselage and twin Lewis guns in the observer's cockpit. The B2 version could be fitted with an additional Lewis gun that fired downwards through the rear fuselage floor and had a maximum bomb load of 256kg, carried on underwing racks. The reconnaissance version was followed into production by the bomber in the summer of 1917, the latter differing in having Breguet-designed automatic trailing-edge flaps on the lower wings and transparent panels in the sides of the observer's cockpit. Late production examples of both versions had horn-balanced ailerons, the B2 aircraft thus equipped doing away with the trailing-edge flaps. 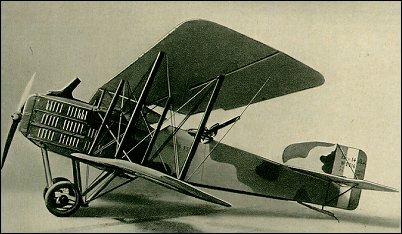 A single-seat long-range version, known as the Bre 14 B1, was also built in limited numbers during 1918, and was intended to bomb Berlin. In fact it was little used and never mounted an attack on the German capital. Breguet 14 also equipped American and Belgian units during World War I, some powered by Italian Fiat A-12 and A-12bis engines. Breguet 14 remained in service in the colonial/TOE version throughout the 1920s, equipping many overseas units. A number of foreign countries also flew the type. Many ex-French aircraft were handed over to Poland in 1919 and these took part in the fighting with Russia in 1920. The type formed part of the initial equipment of the Czech air arm, and others were operated in Brazil, China (70 with 298kW Lorraine-Dietrich engines), Denmark, Finland, Greece, Japan, Portugal and Spain. The Spanish equipped four squadrons in Morocco in 1922, using them on missions against Riff tribesmen. A further 40 were obtained in 1923. A small number of float variants were also built, mostly with a central main float and small wingtip stabilising floats. During 1919 Breguet 14 made a number of remarkable long-distance flights and Louis Breguet founded the Compagnie des Messageries Aeriennes with them, making regular air mail flights linking Paris with Brussels and London. These Bre 14 had special mail containers fitted under the wings. A cabin version with provision for two passengers was built as the Breguet 14T. Later came the improved Bre 14Tbis and the three-passenger Breguet 14T2. During the 1920s, the Lignes Aeriennes Latecoere company used more than 100 Breguet 14 in various versions on its routes between Toulouse and Dakar (West Africa) and between Natal and Santiago di Chile in South America. The final version worthy of mention was the 14S air ambulance, adapted from the Breguet 14T. This version was widely operated in the 1920s during the campaigns in Morocco and Syria. Each could carry two stretchers in the rear fuselage. Some 5,500 were produced before the war's end but this pales when it is considered that some 8,370 were produced when production ceased in 1926. Although the Bre.14 appears to be a typical aircraft of the WW-I era, it was not. Unlike most of it's contemporaries, which were made of wood, the Bre.14 was fabricated mainly from light metal alloy. As a result it was much stronger, and a good deal less heavy, than it appeared to be. In addition, the aluminum didn't tend to deteriorate quickly, as wooden aircraft structures often did. Small wonder that these planes remained in service so long after the end of the war, after most other WW-I era aircraft had been scrapped! it brought many crtics to those high ranks officers, however, I can feel its classic feeling everytimes I visited this replica. My Grandfather also flew the Breguet 14B2 in WW1. He flew in the 96th Aero Squadron. Had lots of good stories to tell. We have got a replica here in the RTAF museum. Many years ago, we traded this replica with our remaining Bearcat. Of course, it brought many crtics to those high ranks officers, however, I can feel its classic feeling everytimes I visited this replica. did the cockpit of this plane have a breguet time instrument? or was that timepiece placed in another breguet plane?